In 1908, Mrs. Eddy added the By-law for the Christian Science nurse to our Church Manual. Mind’s infinite wisdom was certainly guiding our Leader, for since then, Christian Science nurses have been at the forefront of the battle of spiritual versus material sense testimony. It has been our joy to support the individual and collective practice of Christian Science nurses. We are so grateful for all the individuals who have cherished Mary Baker Eddy’s vision for the Christian Science nurse and have provided opportunities for coming together to rejoice in this ministry. Here is a chronicle of these efforts. A seminar was organized by Ann Voges solely for Christian Science visiting nurses at Arden Wood, April 28 – 30, 1987 with the theme of “He shall give his angels charge over thee,” based on Psalms 91, and “Angels,” from Miscellaneous Writings 1883-1896, by Mary Baker Eddy. 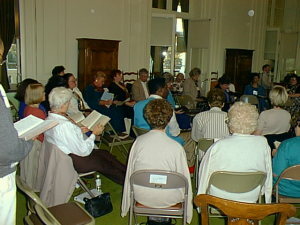 Nancy Butcher (Stevens) organized a second gathering for Christian Science visiting nurses at Principia College, July 18 – 20, 1989 with the theme of “In love and healing ministry show forth the Truth that makes man free,” from the Christian Science Hymnal, #12. 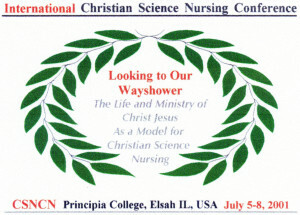 Betty Miller and Esther Joscelyn had the idea of organizing a conference for all Christian Science nurses who advertised in The Christian Science Journal. 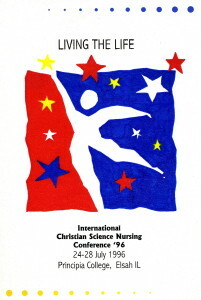 Along with Joye Broughton, Ann Voges and Katherine Pennington, they formed the Planning Committee (PC) which organized the first International Christian Science Nursing Conference (ICSNC) held at Principia College August 12 – 13, 1994 with the theme of “Christian Science Nursing — Its Purpose, Practice & Promise.” Christian Science nurses attended from England, Scotland, Germany, and Australia as well as from across the US and Canada. Vision Now!, started by Nancy Butcher Stevens, and continued over the years under the auspices of several nurses, was originally published for Christian Science visiting nurses. The PC was asked by the newsletter’s then editors to take over its production. The PC broadened its subscriber base to include all Christian Science nurses advertising in The Christian Science Journal. From the newsletter’s inception through 1996, pu blication continued with no subscription fee. 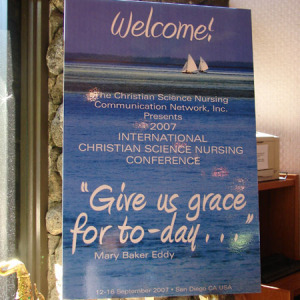 The PC organized a second International Christian Science Nursing Conference. With the theme “Living the Life,” based on a passage in Science and Health with Key to the Scriptures by Mary Baker Eddy (496:14), it was held July 25 – 27 at Principia College. The decision was made by the PC to legally incorporate to provide continuity for the important work under the chosen name — Christian Science Nursing Communication Network, Inc. (CSNCN). They formed a Board of Directors, wrote By-laws and incorporated in the State of Oklahoma in March. In December of that year, the United States Internal Revenue Service granted CSNCN provisional tax-exempt status as a 501(c)(3) non-profit organization, which was later made final. Publication of Vision Now! continued, but due to production costs, a subscription fee of $15 per year for three issues was begun in January. In February, the members of the newly formed CSNCN Board of Directors, Esther Joscelyn, Betty Miller, Kat herine Pennington, Pam Roberts, and Jane Schmidt, met at Arden Wood in San Francisco California to hold the first corporate Annual Meeting, in accordance with the new CSNCN By-laws, and to plan a conference for the fall. The 1998 ICSNC was op ened to all Christian Science nurses, Journal-listing no longer being a requirement, and to all interested Christian Science, practitioners and teachers. 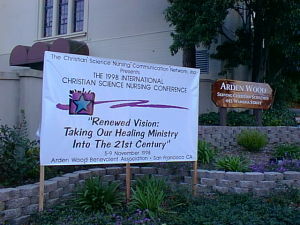 The Conference was held at Arden Wood, November 6 – 8, 1998 with the theme “Renewed Vision: Taking Our Healing Ministry Into the 21st Century,” based on Isaiah 62:10,11 and Science and Health with Key to the Scriptures by Mary Baker Eddy 599:6-7. All of the founding board members completed their terms according to CSNCN by-laws which require rotation in office. The new Board members, Dayne Rae Borgh, Bonnie Castroman, Kathleen Holmes-Takeda, Mary Langworthy, and Wendy Lanning planned the 2001 Conference, with Newsletter Coordinator, Spring Austin (Griffith) assisting at the Conference. The next Conference with the theme of “Dearly Beloved,…Rejoice” based on Paul’s letters of encouragement and hope was held again at Principia College July 10 – 13, 2003. The Board members and planners of this conference were Bonnie Castroman, Kathleen Holmes-Takeda, Mary Langworthy, Wendy Lanning, and Pam Whitney. By mid-summer, most of CSNCN’s board stepped down. With the turnover of 4 of the 5 board members, it appeared that the work of CSNCN would be put on hiatus. However, in October of that year, founding board members Esther Joscelyn, Betty Miller, Katherine Pennington, and Pam Roberts joined remaining member Pam Whitney on the board to preserve the activity of CSNCN as they moved into a Conference year. The Conference this year was a “coming out” for CSNCN into the world/community. It was held at Humphrey’s Half Moon Inn in San Diego, CA on October 19 – 23,2005. The theme was “Feed My Sheep.” Extensive fund raising allowed the CSNCN Board to subsidize the housing costs for all the attendees. In December, the Board was delighted to announce that in 2006, Vision Now! would be sent to all Christian Science nurses on our mailing list without a subscription fee! Delivery of Vision Now! was made electronically for those who had internet access and by regular mail to those who do not. With the retirement of Pam Whitney, after three and a half years of service, Mary Hronek Hollister, from Traverse City MI, joined the Board in February. Conference 2007 was held at Humphrey’s Half Moon Inn in San Diego, CA on September 12 – 16, 2007. The theme of the Conference, “Give us grace for to-day…” was from the spiritual sense of the Lord’s Prayer in Science and Health with Key to the Scriptures by Mary Baker Eddy. Extensive fund raising allowed the CSNCN Board to again subsidize the housing costs for the 100+ attendees. Over the course of the years since taking over the production of Vision Now!, it had grown from a two to four page publication into one that was 16 to 20 pages and offered an advertising venue for various Christian Science organizations that wish to reach the field of Christian Science nurses. 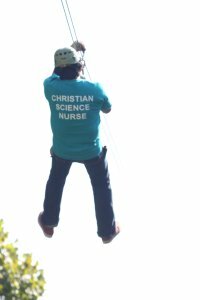 Articles of interest on a specific topic for each issue were written by Christian Science nurses to assist other Christian Science nurses in their nursing practice. As production of Vision Now! (in conjunction with the planning, organizing and hosting a biennial International Christian Science Nursing Conference) had become a challenging task for the five volunteer CSNCN Board members, it was decided to find other volunteers to take over the production of Vision Now! while still maintaining oversight of the newsletter content and production. In March 2008 we had a volunteer production team in place. Ultimately we expected to write a production notebook with guidelines for all the volunteer positions involved in the production of Vision Now! and to set up a production timeline for each issue. Focus topics for the 2008 issue of Vision Now! were: March focus on Foods, September focus on the Church Manual By-law (Article 8, Section 31) for the Christian Science nurse (as 2008 is the 100th year anniversary of its writing). With the retirement of Betty Miller of San Diego CA, we welcomed Bonnie Mitchinson from Naperville IL to the board in August. Goals for 2008 included working with the new Vision Now! Production Team, beginning the fund raising process for 2009, and conducting other business important for the running of CSNCN. Pamela Roberts retired from the board in early 2009 and we welcomed Ke rry Reed of Bow NH and Kimberly Thorndike of Cleveland OH onto the board in March and Patricia J. Cameron of Gilford NH in April which brought our board to seven. 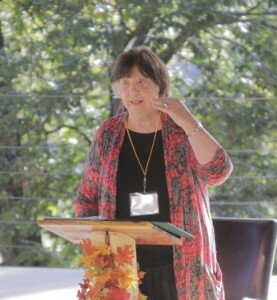 In September, the seventh ICSNConference was held at CedarS Camps in Lebanon, Missouri. The theme was “Dwelling in the Light” and was held from September 16-20th. This year was one of reflection and hard work! Our desire to serve our field lead to some major changes for CSNCN. 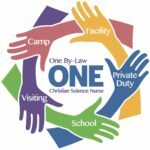 We changed our name to Christian Science Nursing Network and redesigned our website (also a new location at www.csnnetwork.org!). Katherine Pennington retired from the Board. She had been involved with CSNN beginning with the Planning Committee in 1993, helped to incorporate the organization in 1997 to CSNCN and served on the Board until January of 1999. She rejoined the Board in October of 2004 and served until retiring in November of 2010. 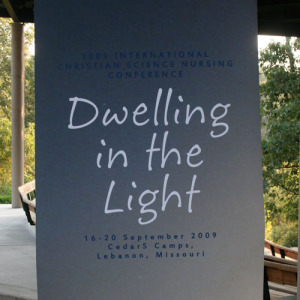 In March of 2011 the CSNN Board, in support the discussion board created by The Mother Church Nursing Activities Department specifically for the exchange of ideas among Christian Science nurses, suspended the regular publication of Vision Now! Held September 7-11, 2011 at CedarS Camps, the theme of the eighth International Christian Science Nursing Conference was “…walking over the wave” from a statement in Science and Health with Key to the Scriptures by Mary Baker Eddy on page 369. Two post conference issues of Vision Now! went out to those Christian Science nurses on our mailing list. Numerous changes occurred in 2012. We held our Annual Board meeting in January via Skype. The biggest change occurred partially as a result of The Mother Church beginning an interactive webpage solely for Christian Science Nurses. On the webpage, Christian Science Nurses were able to share with each other in a timely manner. In February the Board decided it was time to put Vision Now! to bed for a time in support of the Mother Church webpage for Christian Science Nurses. We did do two post Conference issues of Vision Now! (one in 2011 and the last in 2012) to share what had happened during the Conference with the field. As the year progressed we took classes and learned how to make many of the changes needed to keep the CSNN website up to date. We also worked on an unseen portion of the site and were able to put up helps to make the Board work easier. In July of 2012 Bonnie Mitchinson retired from the CSNN Board. She had served faithfully for almost 4 years. That same month we welcomed Patricia Brugioni to the Board a Christian Science nurse from the “windy city”. September found the Board in Albany, NY beginning the planning of the 10th International Christian Science Nursing Conference to be held the following September. Work progressed and the CSNN Board and all those in attendance welcomed the Board of Directors from The Mother Church in person (a first) to the 10th International Christian Science Nursing Conference. Held again at CedarS Camps (September 4-8) the theme was: “All Taught of God” from citations in John 6 and 1Thessalonians 4. A lengthy post conference issue of Vision Now! went out to those Christian Science nurses on our mailing list in October 2013. Copies of the keynote address at the 2013 ICSNC by Kim Korinek and the inspirational Bible talk by Christine Irby Williams were published in March and June of 2014 respecively. Early November was spent migrating our website from one server to another. We were up and running with the new server by the 8th of November. Early in January, 2014 Patricia Cameron retired from the CSNN Board after serving 4+ years and helping to plan three International Christian Science Nursing Conferences. February found the CSNN Board meeting in person at Lynn House in VA to complete their Annual Meeting and to join many of the Lynn House Christian Science nursing staff in a special workshop in the correct use of sliding sheets from the UK to move and transfer patients. In June we welcomed Elizabeth Harned to the CSNN Board and sent our final 2013 ICSNC edition of Vision Now! It included the announcement that we intend to do a quarterly publication titled Notices & News from CSNN. Its purpose is to provide a forum to support communication from the field to individual Christian Science nurses. It will give Christian Science organizations or individuals in the field an opportunity to advertise employment, educational opportunities/class schedules, grants/scholarships and housing for Christian Science nurses. In September the CSNN Board met in Albany, NY for a face to face meeting to begin planning 2015 ICSNC to be held at CedarS Camps in September of 2015. Early January the Board held its Annual Meeting via Skype. Planning for the 2015 ICSNC continued and registration for the conference began in mid-May. Prior to May the Board worked at length with our web designer at IQ Computing to develop forms that could be used for this conference and we hope with some modification for future conferences. Registrations continued to tickle in over the summer months. Several Christian Science nurses requested and were granted benevolence from CSNN that allowed them to attend the conference. September found the Board in Lebanon Missouri completing the finishing touches for ICSNC 2015. The conference was again held at CedarS Camps where everyone that attends is wonderfully welcomed and nursed. The theme was “Serving in the Newness of Spirit: Enlarging our Borders, Strengthening our Base” inspired by Romans 7:6 and Science and Health With Key to the Scriptures 430:6 by Mary Baker Eddy. The conference began with a Wednesday evening Testimony meeting on September 9 and ended with a concert given by Désirée Goyette on Saturday evening, September 12, 2015.
out in December. A final post conference issue was mailed in February, 2016. Throughout the year there were four issues of Notices and News from CSSN e-published and sent to those on our mailing list. Each issue had numerous notices in it from Christian Science organizations in most cases seeking employees. Charges for placing notices were terminated in mid 2015. Early in January Elizabeth Harned stepped down from her position on the Board leaving our number at five. corporation’s by-laws as well as the policies and procedures. Late in June, Deborah J. Stucker joined the Board and will be sharing the office of Secretary with Esther Joscelyn. In September the Board met in Akron, OH and began planning the 12th International Christian Science Nursing Conference. The theme of “One By-Law, ONE Christi an Science Nurse” was decided upon. The CSNN Annual Meeting was held in January via Skype. During the Election of Officers Esther Joscelyn stepped down as Secretary after having served for almost 20 years. Deb Stucker was elected in her stead. Mary Hollister remains as President of the Board with Kim Thorndike as Treasurer. In late April Kerry Reed stepped off the Board again leaving our number at five. In early June Patricia Brugioni stepped off the Board to work in other endeavors. Both Kerry and Patty will be missed. In Mid-June Alistair Budd from the UK joined the Board. Hollis Tiger Wines was appointed to the board in October of 2017. The board held their 2017 Annual Meeting at Arden Wood before the Strategic Planning Meeting sponsored by the Philanthropy Forum in January, 2017. The board was asked to be a part of the Strategic Planning Meeting. Esther Joscelyn retired from the CSNN Board on February 15, 2018.